Chongjin Railway Factory is one of two major railway manufacturing facilities in North Korea's eastern corridor. Analysis of this facility can be a brick-and-mortar sign-post of foundational infrastructure progress if the trust-building project of reconnecting the Koreas' railways is carried out. Railway manufacturing facilities have served as a necessary link in North Korea’s underdeveloped economy, presently offer new possibilities in inter-Korean relations, and will be foundational infrastructure for future unification. However, knowledge of North Korea’s infrastructure is lacking according to a pilot survey of regional experts conducted by CSIS Beyond Parallel. 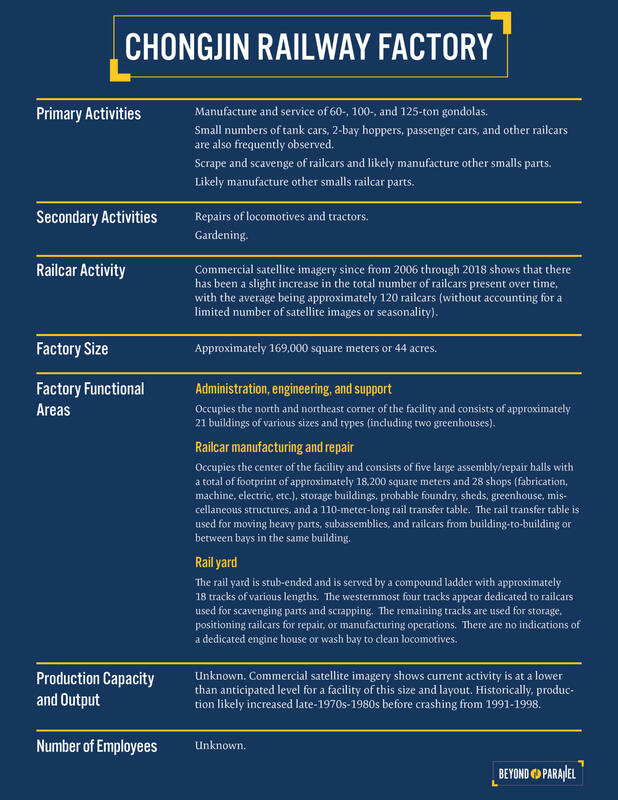 The following in-depth study of North Korea’s railcar manufacturing infrastructure seeks to begin to address that void. While the Chongjin Railway Factory is currently active, commercial satellite imagery shows this activity is at a lower-than-anticipated level for a facility of this size and layout, suggesting shortages of raw material, energy, financial resources, administrative malaise, economic limitations, or any combination of these. North Korea's railroad system, with over 7,400 kilometers (km) of track, is critical both to the North Korean economy and national defense, serving as the primary means for long-haul cargo and passenger transportation.1 Chongjin city, the largest city by square kilometers outside North Korea's capital, is a key part of this system as the most significant hub on the North Korea section of the freight rail line connecting Beijing, China, and Khasan, Russia, and one of a handful larger hubs in the domestic railway network. Most significantly, Chongjin is also home to North Korea's second-most active trading port, accounting for 24.2 percent of the country's import/export activity in general cargo, agricultural goods, coal, and steel. The Chongjin port has a handling capacity of approximately 8 million tons, second only to that of Nampho in the southwest.2 It boasts the second-greatest length of dock space usable by commercial shipping in the country at approximately 2,888 meters. The railway factory located in Chongjin, therefore, plays a relatively unassuming, yet vital connecting role in the regional and national economies. As efforts progress to modernize and reconnect the eastern transportation corridor between North and South Korea under the April 27 Panmunjeom Declaration, the railcars produced and serviced at the Chongjin Railway Factory could play an increasingly important role. The Chongjin Railway Factory is one of just five major industrial facilities that undertake railcar production and depot-level repairs for the nationwide network. It is primarily engaged in the manufacture, repair, and scrap of railcars. Some small parts are likely manufactured within the factory, while others are scavenged from scrapped railcars or procured from local light industries. While the factory is active, commercial satellite imagery shows this activity is at a lower-than-anticipated level for a facility of this size and layout, suggesting shortages of raw material, energy, financial resources, administrative malaise, economic limitations, or any combination of these. The Chongjin Railway Factory (41.793718 129.796317) is located in the eastern section of Chongjin city and adjacent to the Chongjin Chongnyon Rail Station. 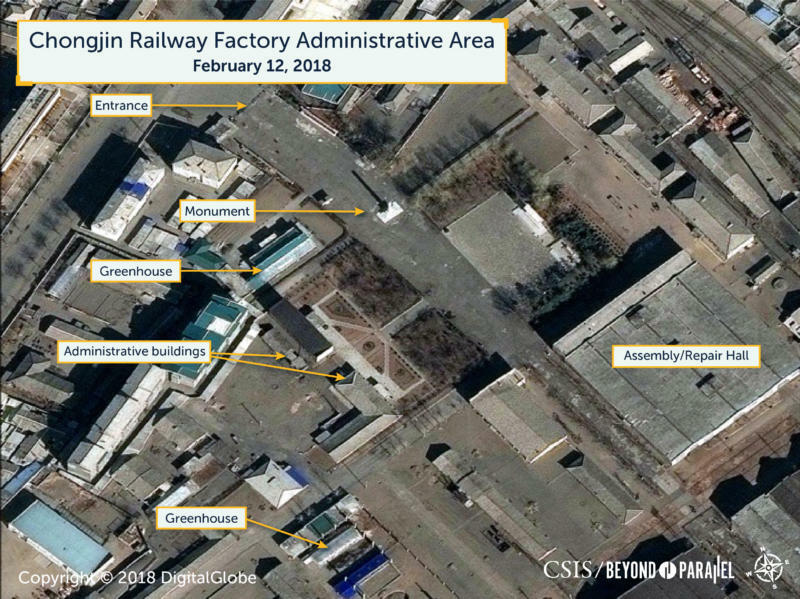 As of February 2018, the Chongjin Railway Factory is an active repair and production facility and is being maintained at a reasonable level by North Korean standards. While there are approximately 140 railcars of various types present in the railyard, there are no visible indications of any significant new railcar production. This activity, however, could easily be missed if it is undertaken at a low level. Despite the importance of railway system and by extension its associated manufacturing facilities, outside knowledge of North Korea's infrastructure is lacking, according to a pilot survey of regional experts conducted by CSIS Beyond Parallel. 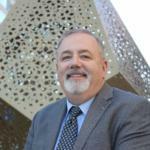 When experts from the United States, South Korea, Japan, and Russia were polled, approximately 50 percent said they believed there was insufficient or no empirical analysis available on infrastructure. For example, of the South Korean experts surveyed, 46 percent said this of China, 50 percent of Japan, and 71 percent of Russia. 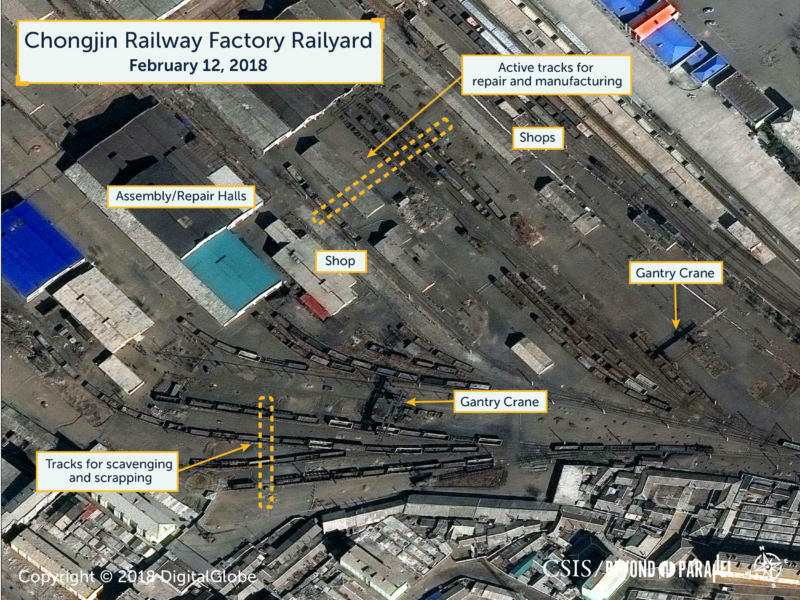 Commercial satellite imagery indicates the primary type of railcars manufactured and serviced at the factory are gondolas and hoppers used primarily to haul mineral ore and coal from mines to heavy industries and powerplants in the province, especially the Songjin Iron and Steel Complex, Sonbong Thermal Powerplant, Kimchaek Iron and Steel Complex, and Chongjin Structural Steel Works. In turn, the Kimchaek Iron and Steel Complex and Chongjin Structural Steel Works provide the finished and semi-finished products to the Chongjin Railway Factory for railcar manufacture and repair. 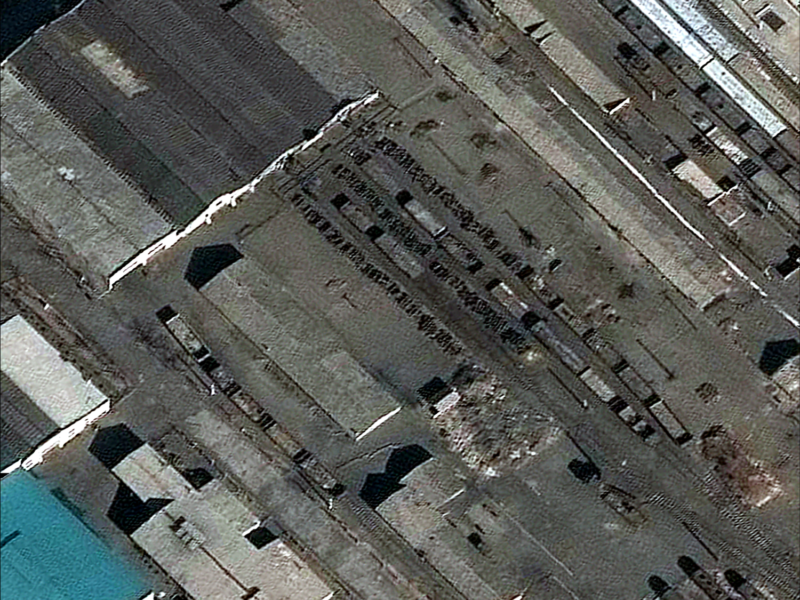 Aside from the movement of rail cars, few external changes of significance have been observed at the factory between 2006 and 2018 with the exception of the replacement of an assembly/repair hall roof between 2016 and 2017, and the replacement of roofs on a second assembly/repair hall roof and support building between 2017 and 2018. With regards to the movement of railcars, those positioned on tracks leading to the main assembly/repair hall on the east side of the facility exhibit regular changes in numbers and types of railcars present. A number of tracks on the west side of the yard, apparently used to store railcars for scavenging spare parts and eventual scrapping, have railcars that have not moved in years. The imagery also shows piles of rubbish throughout the facility. However, this is somewhat typical of railroad facilities such as this and should not necessarily be taken as an indicator of level of activity. Obvious in any summer or fall imagery of the factory is that almost all open space at the Chongjin Railway Factory is used for gardening. While such gardening is typical of large industrial facilities in North Korea, the level seen at the Chongjin Railway Factory appears somewhat high which is likely an indicator of a reduced level of railway-related activity. 2. Dongwoo Yim and Rafael Luna, eds., "North Korea Atlas," South Korea: Damdi Publishing Co., May 2004. 173; 219. 3. For example, Collection of Kim Il Sungs Anecdotes, Vol. 8 Published, KCNA, January 13, 2016; and Kim Jong-il Sends Rolling Stock to Ch'ongjin Railway, KCBS, May 3, 1999. The Chongjin Railway Factory is believed to be directly subordinate to the Ministry of Railways and, along with four other major industrial facilities, is responsible for production and depot-level repairs. 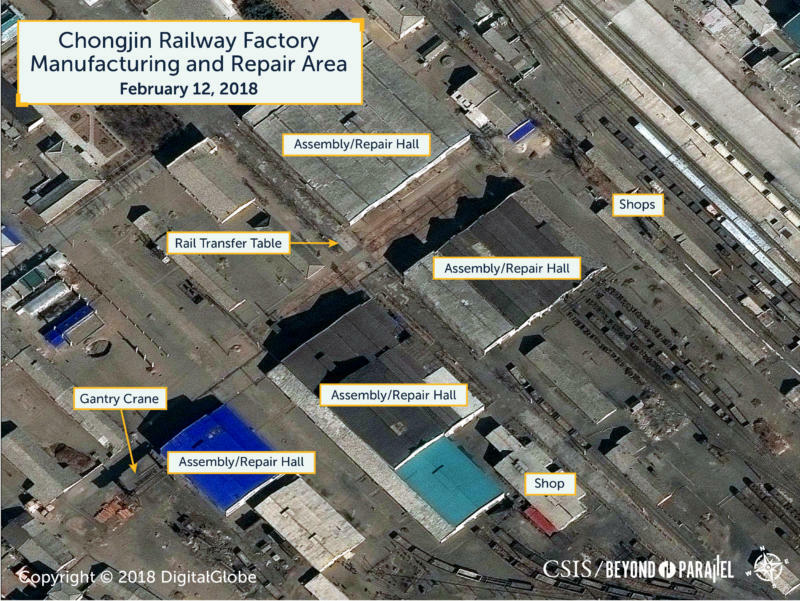 The Chongjin Railway Factory is believed to be directly subordinate to the Ministry of Railways and, along with four other major industrial facilities, is responsible for production and depot-level repairs. Chongjin’s four sister facilities are the Wonsan Railway Rolling Stock Complex, 6 July Railway Factory, Kim Chong-tae Electric Locomotive Works, and the Pyongyang Rolling Stock Repair Plant. Reflecting a general geographic division of the nation into east and west coasts caused by several north-south mountain ranges, three of these facilities are a part North Korea’s east coast transportation corridor-- the 6 July Railway Factory in Rahung, the Chongjin Railway Factory, and the Wonsan Railway Rolling Stock Complex. The Ministry of Railways also exercises control over the rail network including research and development, education and training, security, railroad operations, acquisition and production. 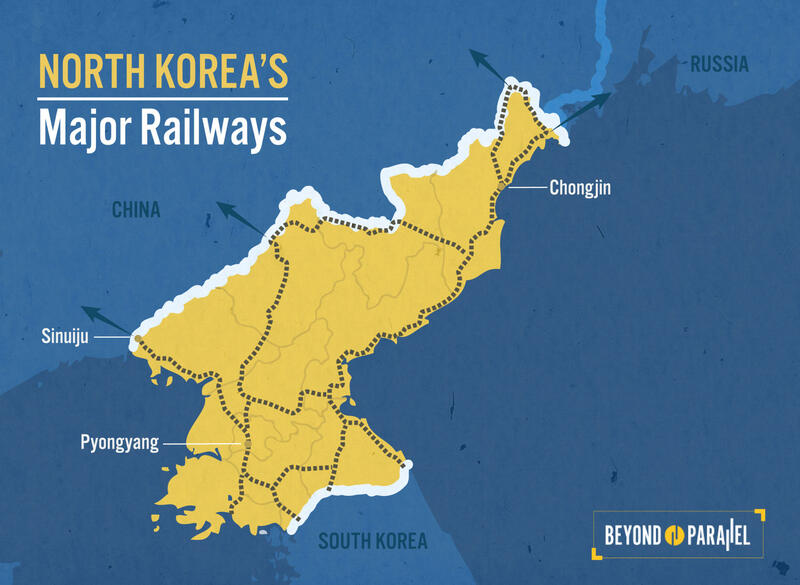 Rail operations are conducted by the Korean State Railway through at least six regional bureaus—Chongjin, Hamhung, Kaechon, Pyongyang, Naseon, and Sariwon. Subordinate to these regional rail bureaus are more than 20 secondary repair shops and 50 engine houses located along the rail network throughout the nation that undertake minor repairs and routine maintenance. While the Chongjin Railway Factory is believed to be directly subordinate to the Ministry of Railways, its location in Chongjin means that it works closely with the Chongjin Railway Bureau and has access to its ancillary facilities such as the Chongjin Railway Bureau Hospital. The factory’s relationship to other railway facilities in the area such as the Chongjin Railway Transport College, Chongjin Railway Special School, and Chongjin Railway Paint Factory is unknown. Source(s): For example, “Overflowing with conviction to powerfully wage an all-out assault and brilliantly conclude this year's battle,” Rodong Sinmun, October 15, 2012, 4; “Pyongyang Rolling Stock Repair Plant,” KCBS, November 27, 2007; Hwang Myo'ng-hu'i, “Level Arm Tower Crane Produced at the Pyongyang Elevator Factory,” Rodong Sinmun, October 6, 2005, 5; Yi Kyong-hwa, “Blow the Whistle of Innovation High for a Turnaround in the Railway Transport!,” Rodong Sinmun, May 11, 1999, 3; and “Day of Railway Workers,” KCNA, May 11, 1998. There are numerous English-language variations for the names for these five facilities. Among the more common are Kim Chong-T'ae Electric Locomotive General Enterprise, Kim Chong-t'ae General Electric Locomotive Works, Kim Jong Thae General Electric Locomotive Works, June 4 General Rolling-Stock Works, 6 July General Railway Factory, July 6 General Railway Factory, 7.6 Vehicle Parts Factory, and the Pyongyang Rolling Stock Repair Works., The Naseon Railway Bureau is sometimes identified by its older name of Najin Railway Bureau. The KPA and Guard Command exercise some level of control over rail operations that involve the rail movements of Kim Jong-un or military cargos. Author interview data; Oh Jae-hwan, “Security Agencies of North Korea under the Kim Jong Un Regime,” Korean Journal of Defense Analysis, Vol. 26, No. 1, March 2014, 117–131; “Trip Report North Korea October 2004,” http://www.farrail.com/pages/trip-reports-engl/report_nk-oct-2004.html, accessed January 4, 2009; and Kim Chong-min. “The Real State of North Korea's Military Roads and Transportation Equipment,” Pukhan, November 1997, 121–133., Copyright 2018 Digital Globe. By 2000, however, the Chongjin Railway Factory appears to have begun slowly recovering and was reported to be repairing “trains using innovating technology.” It was apparently also diversifying as a report from August 2000 states that the factory was now also repairing tractors. While this may have been a reflection of the expanding practice for industrial facilities to undertake work outside their normal area of operations, it appears to be more an indication that the factory was still facing significant challenges in procuring raw materials (for railcar production). This assertion appears supported by a nationwide campaign that year to collect scrap iron for use in steel mills. The Ministry of Railways was responsible for transporting the collected scrap iron to the steel mills and claimed great success in doing so. In December 2000, the Korean Central Broadcasting System reported that the Chongjin Railway Factory had “achieved its annual plans.” These claims on the surface, however, appear difficult to accept. Throughout 2001 there were reports that the Chongjin Railway Factory was accelerating the repair of freight cars and had been one of 92 industrial enterprises granted awards for their achievements. Such reports continued throughout 2003 and 2004. Source(s): “Kim Jong-il Sends Rolling Stock to Ch'ongjin Railway,” KCBS, May 3, 1999., “Ch'ongjin Railway Factory,” KCBS, June 12, 2000., “Working Class of Ch’ongjin Railway Plant Score Gains,” KCBS, August 9, 2000., “Railway Workers Transport Scrap Iron to Steel Mills,” KCBS, November 18, 2000., “Ch'ongjin Railway Factory,” KBCS, December 19, 2000., “Ch'ongjin Railway Factory,” KCBS, October 17, 2001; “Ch'ongjin Railway Factory,” KCBS, February 22, 2001; and “Exemplary Plants, Enterprises Awarded,” KCBS, February 15, 2001., “Functionaries of Ch'ongjin Railway Factory,” KCBS, August 5, 2004; “Functionaries and Workers of Ch'ongjin Railway Factory,” KCBS, April 20, 2003; and “Ch'ongjin Railway Factory Pushes Ahead with Repairing Trains,” KCBS, February 3, 2003. The Arduous March, the prolonged period of dramatic droughts and floods resulting in nationwide famine following the collapse of the Soviet Union in 1991 and generally agreed to have ended in 1998 with its effects lasting into the 2000s, caused dramatic disruption in the symbiotic relationship between the production of iron and steel and the railroad network, as the former was not able to produce iron and steel without the raw materials provided by the latter. Railroad infrastructure faced its own challenges and was not able to provide the ore and coal without the steel and iron needed for rails, railcar production, and repairs. 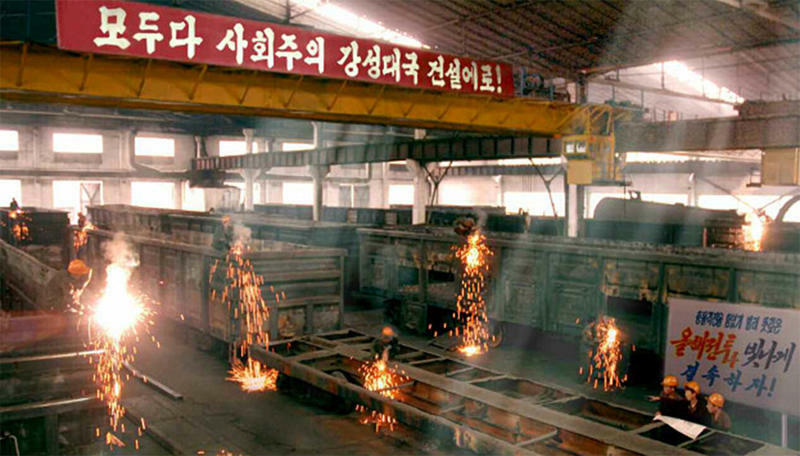 Additionally, Kimchaek Iron and Steel Complex and Chongjin Structural Steel Works either operated irregularly or suspended operations for long periods. While there was little North Korean reporting on the Chongjin Railway Factory or railcar production and repair during the Arduous March, it may be deduced that the period had resulted in the dramatic curtailment, if not suspension, of railcar manufacture at the factory. During a May 1999 conference on the need for increased iron, steel, and mine production in North Hamgyong Province, it was announced that “Comrade Kim Jong-il, the great leader of our party and our people, sent rolling stocks to the Chongjin Railway Bureau.” Had the Chongjin Railway Factory been operating effectively at this time there would have been no need to do so. Source(s): Joseph S. Bermudez Jr., “Kim Chaek Iron and Steel Complex: Down but Not Out,” 38 North, June 20, 2016., “Kim Jong-il Sends Rolling Stock to Ch'ongjin Railway,” KCBS, May 3, 1999. During the Korean War, the city of Chongjin, including the railroad workshops, was heavily damaged by United Nations Command air strikes. During the Korean War, the city of Chongjin, including the railroad workshops, was heavily damaged by United Nations Command air strikes. With the signing of the Armistice Agreement in 1953 North Korea undertook reconstruction efforts with assistance from China, the Soviet Union, and other communist countries. One of the first areas for reconstruction was the rail network throughout the nation. As with the other major rail facilities the Chongjin railroad workshops were rebuilt with machine tools and equipment imported from China, the Soviet Union, and Poland. 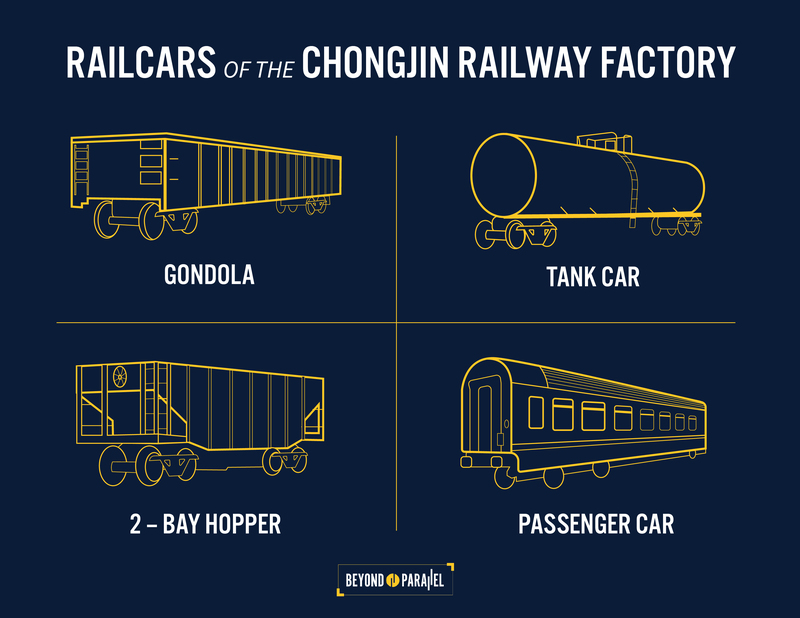 It is presently unclear both when the railroad shops at Chongjin were officially renamed the Chongjin Railway Factory and when the facility was expanded to allow for the serial production of railcars. 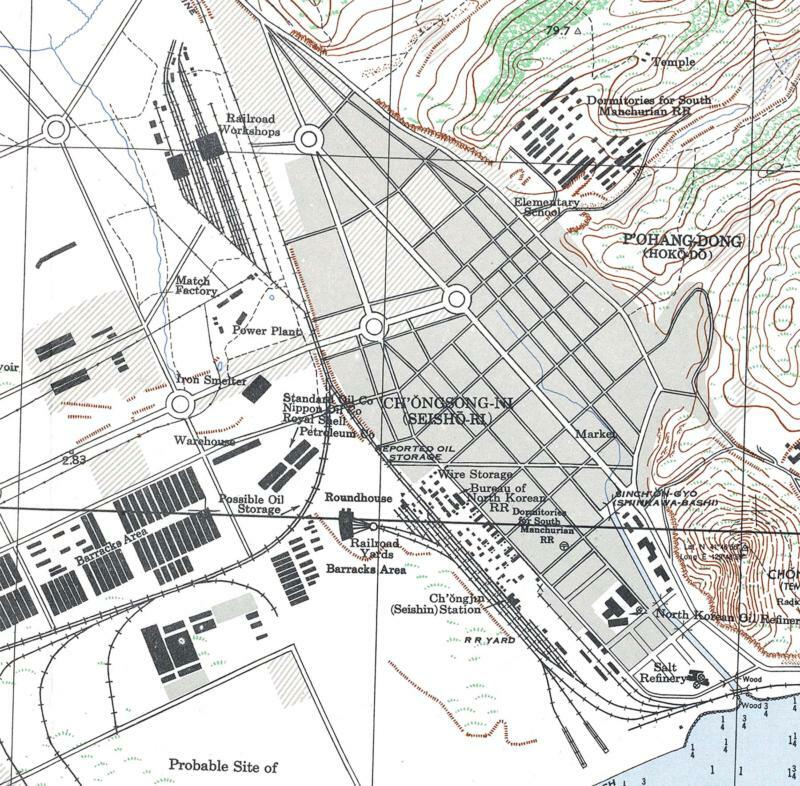 Declassified satellite imagery from January 1976, however, shows a facility that differs little in size and composition from that seen on the U.S. Army’s 1946 city map. This suggests that the formal establishment of the factory may have occurred sometime after the Supreme People's Assembly held in December 1977 when Kim Il-sung established strategic direction and guidelines for railway development and railcar production. 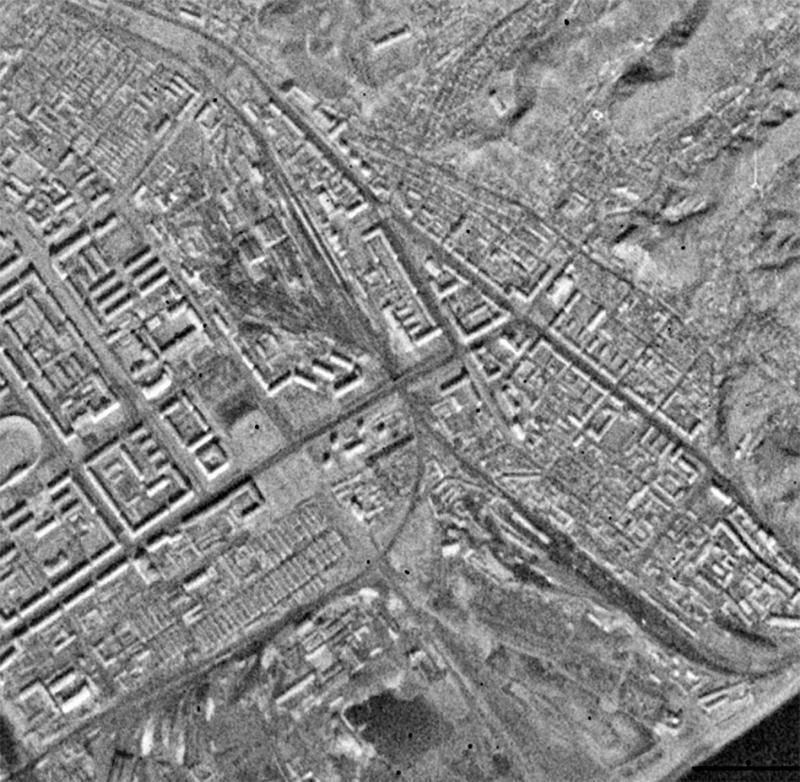 Source(s): A declassified medium-resolution (6-9m) KH-9 image taken on January 27, 1976 of central Chongjin showing the area of the Chongjin Railroad Factory. Central Intelligence Agency., An Pyong-min, “The Significance and Implications of the North-South Railway Linkage Project,” 27–95. The first significant railroad activity in the Chongjin area occurred during the colonial period as part of a broader Japanese effort to construct a rail network throughout Korea. The first significant railroad activity in the Chongjin area occurred during the colonial period as part of a broader Japanese effort to construct a rail network throughout Korea. Track was laid connecting Hoeryong in the north through Chongjin to Wonsan in the south. Within Chongjin railroad, facilities were constructed to support this rail line and service the port facilities, nearby mines, and later the Seishin Iron and Steel Works, Mitsubishi Iron Works, and other industries. Significant among these facilities were the railroad workshops in the northern section of the city. “In order to build a new Korea, we must reconstruct the destroyed industry as soon as possible and create a prosperous economy. For that purpose, we must first normalize transportation by restoring railways as the country's artery. ...The running of railways is the equivalent to the circulation of blood in a human body." Source(s): U.S. Army., “Mementos Associated with Immortal Feats of Kim Jong Suk,” KCNA, December 22, 2017., As reported in An Pyong-min, “The Significance and Implications of the North-South Railway Linkage Project,” in Win-Win Proposition for North-South Economic Cooperation (Seoul: Hyundai Research Institute, April 2000), 27–95. North Koreas' railroad system, with over 7,400 kilometers (km) of track, is critical both to the North Korean economy and national defense, serving as the primary means for long-haul cargo and passenger transportation. The railway factory located in Chongjin, therefore, plays a relatively unassuming, yet vital connecting role in the regional and national economies. As efforts progress to modernize and reconnect the eastern transportation corridor between North and South Korea under the April 27 Panmunjeom Declaration, the railcars produced and serviced at the Chongjin Railway Factory could play an increasingly important role. Source: ROK Ministry of Land, Infrastructure, and Transport; CSIS Beyond Parallel. Commercial satellite imagery indicates the primary type of railcars manufactured and serviced at the factory are 60-, 100-, and 125-ton gondolas, used primarily to haul mineral ore and coal from mines to heavy industries and powerplants in the province. Small numbers of tank cars, 2-bay hoppers, passenger cars, and other railcars are also frequently observed. 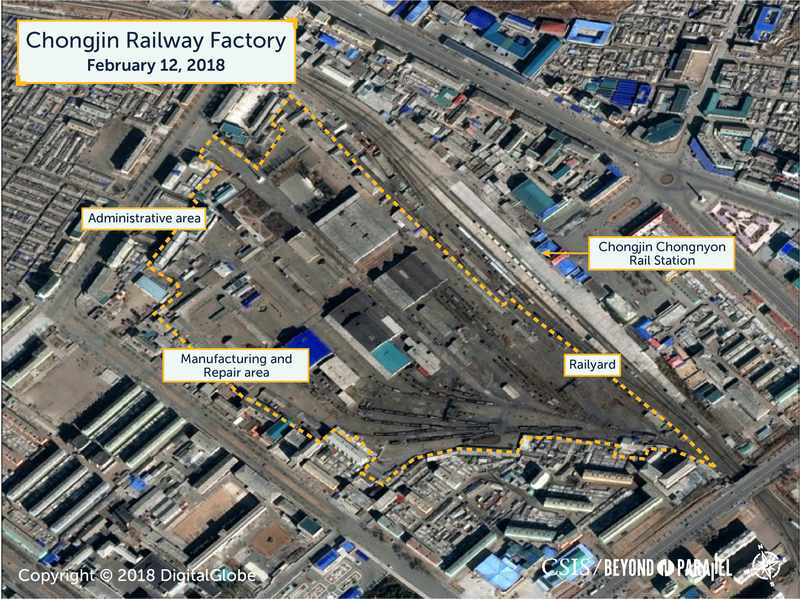 If, going forward, the April 27 inter-Korea agreement is substantially executed, Chongjin and its Railway Factory will be an area of focus given its role in the eastern transportation corridor. Furthermore, evidence of high-level visits to the site would be a significant sign of heightened priority being given by North Korean leadership to transportation infrastructure development and improvements. High-level visits to the Chongjin Railway Factory by Kim Jong-un or other high-level officials. Presence of large numbers of newly manufactured railcars, an indicator of increased economic commitment to the facility and of future plans for the regional rail system. Seasonal decrease in gardening within the factory’s open spaces, a potential indicator of an increased level of railway-related activity. Improvements underway at any of Chongjin Railway Factory’s four sister facilities.